The Marco Polo Bridge or Lugou Bridge is a stone bridge located 15 km southwest of Beijing city center in the Fengtai District. It bridges the Yongding River, a major tributary of Hai River. Situated at the eastern end of the bridge is the Wanping Fortress, a historic 17th-century fortress, with the Museum of the War of Chinese People's Resistance Against Japanese Aggression inside. In recent years, the water of Yongding River has been diverted to different areas of Beijing so often there is no water under the bridge. The name "Marco Polo Bridge" derives from its appearance in Marco Polo's book of travels, where he praised it highly. 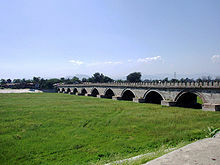 The names "Lugou" or "Lukou Bridge" and "Lugouqiao" or "Lukouchiao" derive from Lugou, a former name of the Yongding. In old bilingual plates, the bridge was also named as "Lu Kow Kiao". Following the Communist takeover of China in 1949, the bridge was decked in asphalt and carried motor vehicular traffic. To alleviate traffic on the bridge, the New Marco Polo Bridge (Chinese: 盧溝新橋; pinyin: Lúgōu Xīnqiáo) located about 1 km to the south was completed in 1971. Later, due to the cultural and historical significance of the old bridge, it was decided that the old bridge be preserved, and another new bridge was to be built to take over the vehicular traffic. The new bridge, which carries the Jingshi Expressway, was built next to the New Marco Polo Bridge in 1985. After the completion of the Jingshi Expressway bridge, vehicular traffic was shifted to the two new bridges and the old Marco Polo Bridge was closed to motor vehicles. The asphalt surface of the old bridge was removed during a restoration in 1986. The Marco Polo Bridge is 266.5 meters (874 ft) in length and 9.3 m (30.5 ft) in width, supported on 10 piers and 11 segmental arches. [note 1] Hundreds of artistically unique stone lions from different eras line both sides of the bridge. The most intriguing feature of these beasts is the fact that there are more lions hiding on the head, back or under the belly or on paws of each of the big lions. Investigations to determine the total number of animals have been carried out on several occasions but the results have proved inconsistent, ranging anywhere from 482 to 501. However, record has it that there were originally a total of 627 lions. The posture of each lion varies, as do their ages. Most date from the Ming (1368–1644) and Qing (1644–1911) dynasties, some are from the earlier Yuan dynasty (1271–1368), while the few lions dating from as long ago as the Jin dynasty (1115–1234) are now quite rare. Four ornamental columns each 4.65 m (15 ft) high and a white marble stele stand at the ends of the bridge. One stele, installed on top of a stone tortoise, records the reconstruction of the bridge by the Kangxi Emperor of the Qing dynasty in 1698. The other stele bears calligraphy by the Qianlong Emperor, a grandson of the Kangxi Emperor. It reads "Morning moon over Lugou" (盧溝曉月 Lúgōu xiǎoyuè). For the 800 years since its completion, the bridge has been a well known scenic spot in Beijing. ^ The number of "legs", or piers, is correct here, even though with X arches one would expect X+1 piers. The "discrepancy" is that each end, or abutment, does not count as a pier. Were they to be counted, one would have the proper number of piers (12) for the 11 arches mentioned. ^ Damian Harper and Daniel McCrohan. Lonely Planet China. Lonely Planet, 2007. ISBN 978-1740599153. p. 176. ^ "Chinese & English bilingual sign 'Lu Kow Kiao', Soldier standing w/...", Getty Images, p.  .